The Variable Valve Timing (VVT) system adjusts the intake valve timing to improve driveability. The engine oil pressure turns the VVT controller to adjust the valve timing. The camshaft timing oil control valve assembly is a solenoid valve and switches the engine oil line. 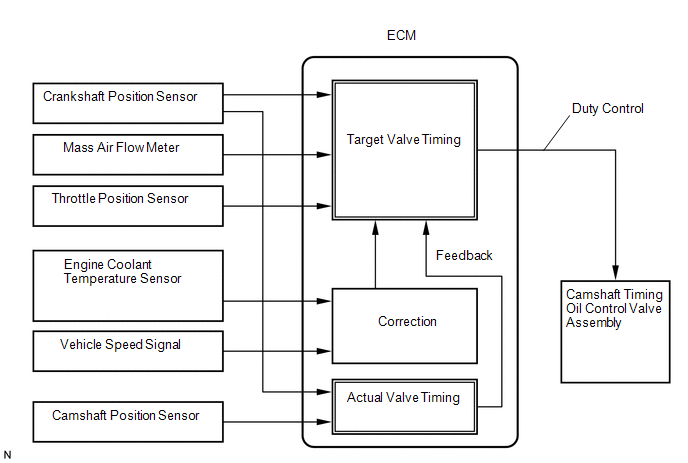 The valve moves when the ECM applies 12 V to the solenoid. The ECM changes the energizing time to the solenoid (duty-cycle) in accordance with the camshaft position, crankshaft position, throttle position, etc. This DTC is designed to detect open or short in the camshaft timing oil control valve assembly (for intake camshaft) circuit. If the camshaft timing oil control valve's duty-cycle is excessively high or low while the ignition switch is ON or the engine is running, the ECM will illuminate the MIL and set the DTC. If DTC P0010 is displayed, check the VVT system (for intake camshaft) circuit. (a) Disconnect the camshaft timing oil control valve assembly (for intake camshaft) connector.